Here’s what’s up in the world of TV for Thursday, February 7, 2013. All times are Eastern. 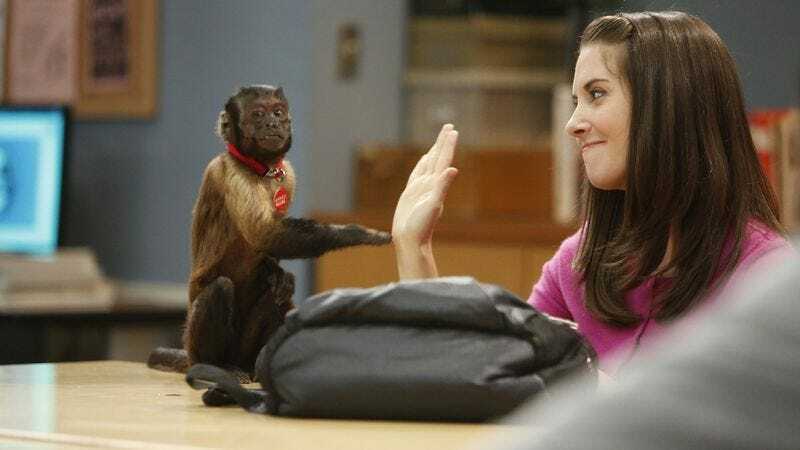 Community (NBC, 8 p.m.): Real talk: We’re writing this a full 30 hours before “History 101” is set to air, and by the time the article goes live, NBC will still have 20 hours to push October 19 a few more pages deeper into the calendar. So we won’t be able to say for sure if Community is airing tonight until it’s actually airing—because there’s always the off chance that February 7 was determined to be the perfect night to launch the retooled Up All Night—but whenever it does, Todd VanDerWerff will be there: Watching. Lurking. Running. Jumping. Hurdling. Sleeping. No, he can’t sleep. You sleep. Todd VanDerWerff reviews Community. The Big Bang Theory (CBS, 8 p.m.): Will a tiff between Sheldon and Leonard destroy The Big Bang Theory’s core relationship? Of course it won’t. But Oliver Sava likes pretending that there’s a version of this show that centers around an apartment shared by Sheldon and Amy—even if that fantasy only lasts for 30 minutes. The Vampire Diaries (The CW, 8 p.m.): Discontent with the walkathons and benefit concerts employed in the search to wipe out other afflictions, The Campaign to Cure Vampirism (unofficial title) heads to a “mysterious island.” If the show doesn’t find its cure there, but does find a polar bear or Hervé Villechaize, Carrie Raisler suggests it stay for a few weeks. The Office (NBC, 9 p.m.): Let’s stop bagging on Brian the soundman for a second and focus on the Erin-Pete relationship, which—wait, he’s made his way into the episode synopsis? UGH. Erik Adams hopes for the best, but girds himself for the worst. Person Of Interest (CBS, 9 p.m.): Phil Dyess-Nugent initiates the inaugural gathering of Occupy Person Of Interest while Reese and Finch protect a wealthy tech guru. Because when a show that’s owned in part by two huge media conglomerates and funded by several multinational corporations, someone has to speak truth to power, right? Glee (Fox, 9 p.m.): It’s “Diva Week” on Glee, which seems like an excuse to let the most petulant and grating aspects of the characters’ personalities shine bright and loud. But it also means Unique gets to sing Beyonce, so you won’t find Brandon Nowalk complaining. Project Runway (Lifetime, 9 p.m.): This week’s client is also the show’s host: Heidi Klum has a new fragrance line, and the designers must create garments that reflect the parfum du Klum. As Sonia Saraiya knows, one day a scent is in (your nose), and the next it’s out—because that’s how breathing works. Elementary (CBS, 10 p.m.): A case involving Sherlock’s former dealer threatens to push the master detective toward old bad habits. With Myles McNutt recovering from his own personal Elementary bender, an A.V. Club-approved sponsor will be assigned to relieve him of the burden of reviewing this episode. Suits (USA, 10 p.m.): David Costabile is back (probably in a suit), and he’s looking for revenge. Carrie Raisler bets it has something to do with the leak of this incriminating video. Legit (FX, 10:30 p.m.): Comedy about air travel is totally hack, but if Jim Jefferies has a bunch of bad airplane experiences, what is he supposed to do—not channel them through an episode of Legit? Meanwhile, Steve Heisler wants to know: What is the deal with airline food? Star Trek: Deep Space Nine (11 a.m.): Klingons, Klingons, Klingons: The once-mighty race fell several rungs down the “Enemies of the Federation” ladder during Star Trek: The Next Generation, but this week’s Deep Space Nine twofer intends to return them to their former place of dishonor. Zack Handlen approves, so long as he isn’t forced to eat Rokeg blood pie. Guinness World Records Gone Wild (TruTV, 8 p.m.): Thanks, but we’ll just wait for the Arrested Development parody, Incredible Feats With Low Self-Esteem. Though it’s nice that they let Dan Cortese host this thing—he’s a surfboard. Two And A Half Men (CBS, 8:30 p.m.): Jaime Pressly guest-stars as Jake’s age-inappropriate girlfriend—and all of those “filth” comments from President Angus T. Steakflower gain a new level of clarity. Deadliest Space Weather (Weather, 9 p.m.): Here’s a fun game to commemorate the the conclusion of Deadliest Space Weather’s first season: Take the name of any given episode, add “of [Italian culinary term]” and presto: instant space opera title. We’ll start with tonight’s installment: “Ice Moons Of Sorbetto.” Don’t you want to read/eat that? Brand X With Russell Brand (FX, 11:30 p.m.): In one fell swoop, Russell Brand’s talk show goes live and expands to fill an hour-long timeslot. Smash may have killed hate-watching, but Brand X just might keep morbid fascination in style. Full Frontal (IFC, 8 p.m.): A Hollywood satire from Steven Soderbergh that boasts an all-star cast. However, unlike a later Soderbergh effort with an all-star cast, none of the characters in Full Frontal are slain by a global epidemic. NBA Basketball: Lakers at Celtics (TNT, 8 p.m.): By the time the Lakers arrive in Boston, Celtics star Kevin Garnett may be headed to Los Angeles—to play for the Clippers. Maybe he can hitch a ride with the Lakers on their way out of town! The Middle (Wednesday): Sue Heck, warrior of optimism, attempts to prove that smiling is contagious. This episode had Will Harris turning up the corners of his mouth, so she just might be on to something.